This was the week of the terrorist attacks in New York City and Washington DC, so it was especially good to get away for a day and get my mind on something less depressing. Leaving home at 4:30 AM, I drove straight up to Waterville Valley to make the standard north to south loop of the Tripyramids. I parked at the Livermore Trailhead lot off Tripoli (pronounced Triple-eye) Rd, then put on my backpack and started down the trail. Although it's gated, at this point the trail seems to be referred to as Livermore Road. It's a wide smooth graveled lane that is actually very pleasant to walk on, especially on a mid-September day with a touch of early Autumn in the air. 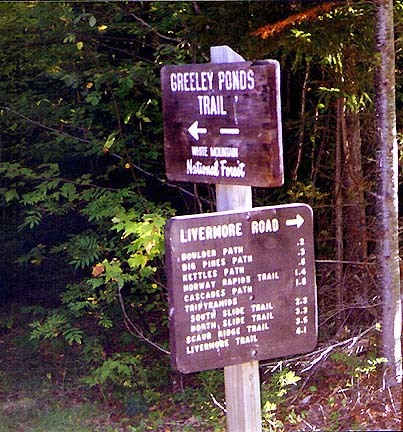 After crossing a branch of the Mad River on a bridge, the road passed, in quick succession, the Greeley Ponds Trail and numerous short paths maintained by the Waterville Valley Association. 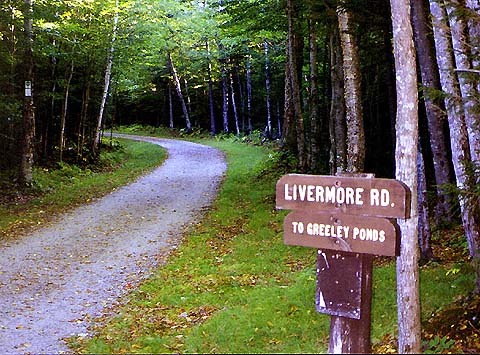 After passing the last Waterville Valley trail, a wide ski trail/road which disappeared to the south over a creosote-oiled bridge, the Livermore Road officially turned into the Livermore Trail. Soon after, it went by what the guidebook said was the site of an old logging camp, which to me looked more like a field or meadow with a few small trees growing in it. Somehow, I guess I expected to see at least a few disintegrating remnants - a rusted saw lying in the grass, an overgrown shack, a pile of discarded cans, anything. It doesn't take long for nature to erase the discarded traces of man's presence. 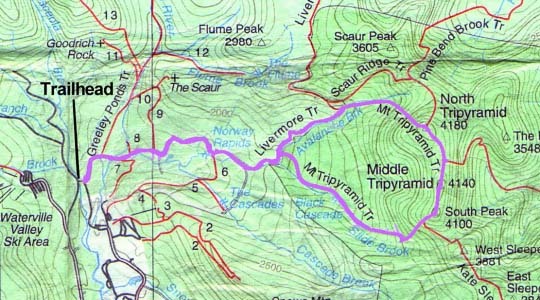 The trailhead for the Livermore Trail. At this point, the trail is called Livermore Road, but is gated, and does not seem to be used as a road anymore. Basswood beginning to turn along Livermore Road. 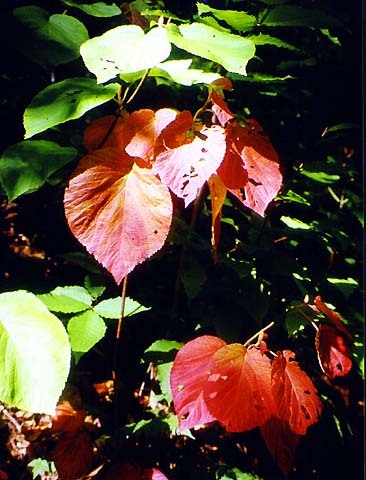 It was a very pleasant day with a touch of early Autumn in the air. An open area along the Livermore Trail. Some of these open areas used to be logging camps, but I'm not sure about this one. Greeley Ponds Trail junction. 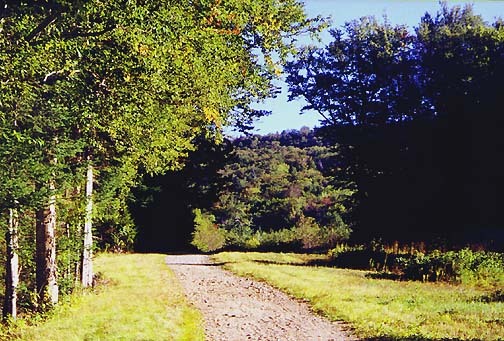 Along the Livermore Trail, there are many junctions with short paths maintained by Waterville Valley.